After a thorough vet check of SAP Escada FRH we have found a reoccurrence of a ligament injury. To avoid any further damage, our vet has advised us that Escada should not be competed anymore. 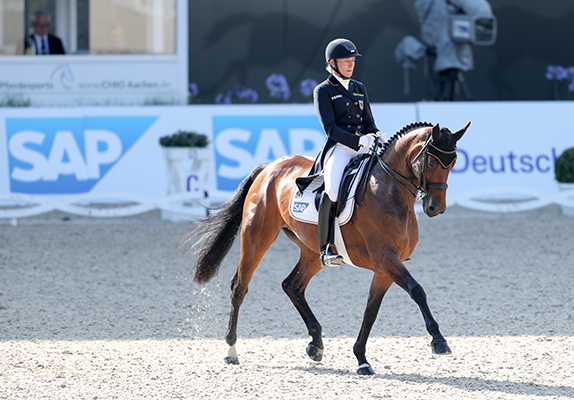 Madeleine Winter-Schulze, the DOKR, the FRH and I are all of the same opinion, that the best decision for our “world class horse”, Escada, is to retire her from her sporting career. Her exceptional quality, her self-confidence and especially her lovable nature are all what makes her our “Diva” and exactly these qualities that will make her a SUPERMAMA! Thanks to Madeleine Winter-Schulze, the DOKR and Christian Reiterer it has been made possible for this lovely mare to be in my barn. Andreas Brandt started her as a 3 year old under saddle and has done all her training up to now. 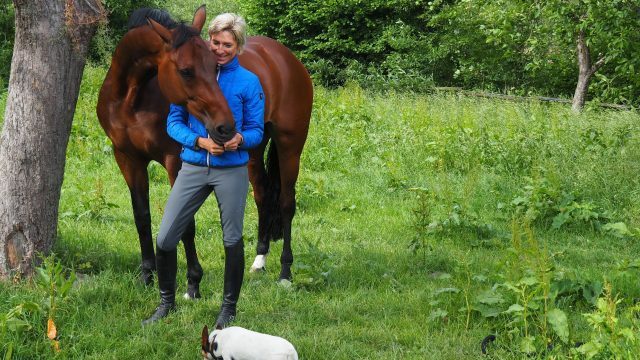 In the last few years he has been very successful ; with the Bundeschampionate as 5 year old eventing horse and also in the WorldChampionships for Young Eventing Horses in Le Lion d ‘Angers 2011 was runner up. She has had very good training and jumps with lots of trust. With her amazingly active hindleg, Escada trots with lots of cadence and power. Character wise she is very self-confident and fearless. She is brave and has an incredible will to perform. She simply gives her best every time and knows that she is special. She is sensitive and aware on the ground and in the stable. Escada shows us exactly what she likes. As well as CIC** and CIC*** placings Escada has also been successful up to show jumping M** classes and finished the CCI*** in Boekelo in 2012 on her dressage score. It has taken some time for her to concentrate on her job in the dressage arena. Through consistent and quiet repetition of the tests in different arenas she is better at concentrating on what I ask of her. In show jumping and cross country she is a dream come true and jumps everything effortlessly. With her ground covering gallop it is pure joy to go cross country. In 2013 at the European Championships in Malmö she showed her true potential, winning not only team Gold but Individual Silver. We had our first S level start in Dressage in 2014 and were even placed. With a win in Marbach CIC*** we were the Professional Rider Champion. In Aachen we came second in the CICO***. At the world championships in France we won the Team Gold. She is absolutely a “World class horse”! 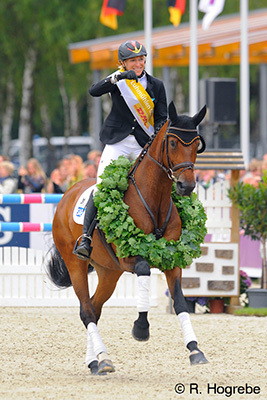 Escada then won the CCI**** in Luhmühlen in 2015 and showed her incredible form by taking home the Aachen CICIO*** winners sash. She has given us just so many moments of pure happiness. In 2016 at Aachen CICO*** we came fourth in the individual and team Silver.